The I.A.C.A. is a group of professional and amateur archaeologists and interested individuals from the Caribbean and overseas who work, or have an interest, in the archaeology of the Caribbean. Our area includes not only the Greater and Lesser Antilles but countries bordering the Caribbean, whose prehistoric and historic cultures often interrelate with those of the islands. Following a first Congress in Martinique in 1961, an Association was founded by the Rev. Pere Pinchon and Dr. Jacques Petitjean Roget in 1962. It was formerly called the “International Association for the Study of Pre-Columbian Cultures of the Lesser Antilles”; it was incorporated in 1985 and the name was changed to “The International Association for Caribbean Archaeology”. The corresponding titles in French and Spanish are respectively “Association Internationale d’Archéologie de la Caraïbe” (A.I.A.C.) 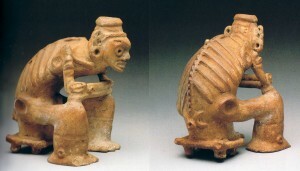 and “Asociación Internacional de Arqueología del Caribe” (A.I.A.C.). The Association aims to promote good management of Caribbean archaeology at both the local and regional level. We support preservation of sites and responsible archaeology throughout the region, and act as a point of contact for archaeologists. Congresses are held every two years in different Caribbean locations, and the Proceedings of the Congresses are published. A newsletter is published at 6-month intervals. We also publish a Directory of Caribbean Archaeologists. Membership is open to all interested parties. Dues are €20 (or US$25) per year payable to International Association for Caribbean Archaeology. Dues-paid members receive mailings such as notifications of Congresses and the newsletter. For more details and a membership application form go to Subscriptions. Please also visit our Facebook page!